This article originally appeared in the August 2018 issue of Maine Home + Design Magazine. You can’t see Martin Kremer’s studio from the road. You enter the driveway, which curves and swoops through the woods until, suddenly, you find yourself at the “auto court,” as landscape designer Soren deNiord describes it. This is where Kremer’s Maine College of Art students park when they come to work in the studio, learning how to fuse, polish, and shape glass from the awardwinning artist. And this is where I leave my car to begin the short walk to Kremer’s contemporary, eco-friendly house. As I approach, the artist’s house reveals itself slowly. It was intended to sink into the summer landscape and blend seamlessly into the native trees. Surrounded by wildflowers and bushy rows of lavender, the wood-sided structure rises and falls under a series of asymmetrical rooflines. It’s set back into the woods, just 50 feet from the Royal River, where Kremer and his wife, Barbara Merson, hope to someday go kayaking. (“We plan to put in a dock soon,” Kremer reveals. 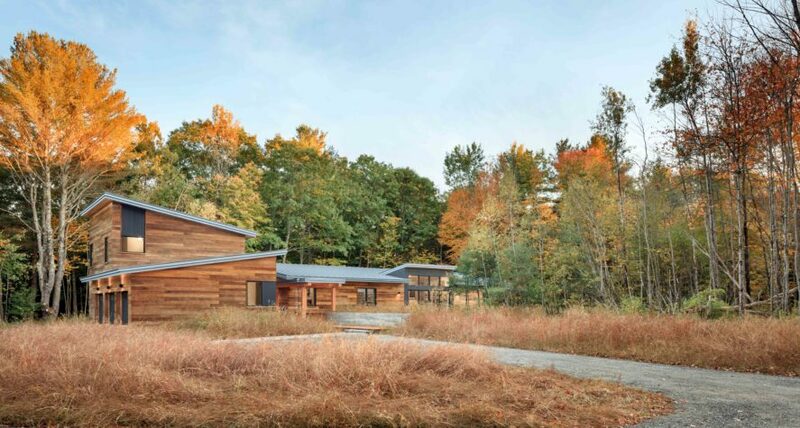 “We have a lot of plans.”) Although the studio and the home are two distinct buildings, they feel united, thanks to architect Harry Hepburn’s thoughtful use of materials and echoing forms. “Our whole approach was to minimize the disruption to the existing landscape, which they [Kremer and Merson] loved,” Hepburn says. “We also thought a lot about the relationship between the studio and the house. We wanted to create visual separation, acoustic separation, and a sense of privacy between the two.” The studio is an educational space, which means it’s somewhat in the public realm, while the house is a purely private structure. The curved driveway, which veers down a hill and enters the three-car garage (located below the guest wing), helps keep the home from feeling like it’s too close to the studio. To keep things cohesive, Hepburn used similar materials on both structures. “The studio is an inverse of the house,” he explains. “We wanted it to connect to the home without replicating it, so we used the same materials but in the opposite way.” On the house, they used unfinished Cambia wood siding (made from thermally modified poplar), which will fade over time into a soft, washed gray, paired with color-blocked areas of wood siding painted dark bronze. On the studio, they used wood siding painted the same dark bronze color, with highlights of prefinished shiplap siding to reflect the Cambia. While they considered putting in polished concrete floors, the couple ultimately decided they liked the warmth and look of natural wood. The red oak floors pair nicely with the Douglas fir trim (“it picks up the warmth of the bronze and the Cambia,” says Hepburn), the bamboo cabinets, and their custom-made cherry furniture. They own several standout pieces that they had commissioned from Maine-based craftsman Louis J. Charlett for their New York home. When they moved to Maine, they wanted to bring their curio cabinet with them, as well as their cherry display case for Kremer’s intricate diorama of an eighteenth-century blacksmith’s forge (hand built by his Polish immigrant grandfather). Certain nooks in the house were created specifically to house these larger pieces. To provide further storage space for the couple’s vast collection of glass art, the builders installed glass shelves below the transom windows in the living room. “It was Marty’s idea,” Hepburn says. “During the day, the natural light illuminates the works, and at night, there is a light hidden in the trim that beams up from below.” During my visit, I find my eyes drawn repeatedly to the vases, urns, and sculptures, which glitter with green, yellow, and blue light as the sun dips in and out of the clouds. Thanks to the surrounding forest, the light that filters into the house often takes on a greenish tinge in summer. In the winter, it’s clear, cold, and blue—ideal for viewing art. Whether viewed at the height of summer or in the depths of winter, the couple’s art collection is impressive. They have a bronze sculpture of Jonah and the whale and another of Jacob wrestling with angels. They have paintings inspired by ancient Greek myths and black-andwhite photographs of long-deceased family members. Their taste is eclectic, though they tend to prefer the minimalist lines of Japanese or Scandinavian design. In order to keep their art on continual display, the couple asked for a wider hallway than standard to act as a gallery space, plus a stretch of blank dining room wall to showcase a series of prints by Japanese artist Hasui Kawase. They bought these pieces together, and like the rest of their possessions, they built the collection slowly over years. “Back when we first got married and we lived in the city, there was a tiny print gallery just down the block,” Kremer remembers. “We used to drool over those pieces. We bought one together for our first anniversary, and subsequent ones after that. At some point, we no longer needed excuses.” Grouped together above the dining room table, sandwiched between the wall and big glass windows that open out to the fields, the woods, and the river, these nature scenes serve as a testament to the shared joys of their long marriage. Their lives have been fruitful ones, and here by a river in Maine, they’ve built a place where their art can breathe and their hours can settle softly, like leaves onto the forest floor.